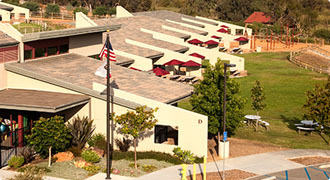 Encinitas Country Day School may maintain one or two preschool classes, serving three-to-five year old children, at our Manchester Avenue campus. Contact the office for availability. Although all are welcome, priority placement is given to families with students enrolled or planning to enroll in our elementary school programs at this campus. Our preschool programs at both facilities are essentially the same except we have all of our Kindergarten classes here at Manchester Avenue. We encourage families considering enrollment or already enrolled to view the video overview of our program on the program page of this area, review the materials available for reading and download, and tour both campuses and get answers to any questions you may have. We are here to support you in your quest to find the right placement for your child. Montessori prepared environments and credentialed staff come together to form the developmental and academic foundation of our school. Traditional exercises in the areas of language, mathematics, science, art and cultural subjects combined with early exposure to geography, history, botany, zoology and physical science lay a foundation for future academic learning. All of our pre-school and kindergarten classes are prepared to teach reading and math skills through the early elementary level. Montessori manipulative phonics, math, reading, and language materials allow children to learn while satisfying their need for movement. 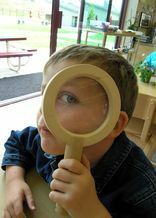 Our Montessori kindergarten classes offer a high movement environment with a more focused reading and math curriculum as well as instruction in conversational Spanish. A warm and loving environment is so essential to the growth of young children that we have made each child’s need to feel secure and valued our number one priority. Every teacher has developed the skills necessary to nurture a child while subtly encouraging independence. e proper balance of these two points is vital to each child’s development. Exploring color, texture, structures and techniques through various art media present each child the opportunity to work creatively. Weekly music classes provide ear training, note reading, rhythm, singing and ensemble participation as well as the use of percussion instruments. Our physical-motor curriculum includes music and movement, yoga, games and sports as well as optional dance and gymnastics classes. The goal of the movement program is to contribute to the child’s balanced development by helping to improve coordination, agility, endurance and self-discipline. 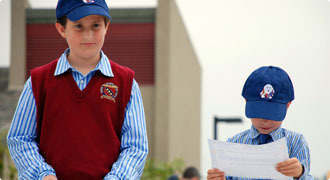 Our character education curriculum is designed to encourage the development of a strong moral foundation. Children are presented with universally accepted principles and encouraged to implement them at school and at home. Honesty, courage, friendliness, patience, courtesy, valuing oneself and serving others are typical principles presented through stories, real life examples and practical exercises. Our cultural studies program encourages an attitude of appreciation and respect for the vast cultural diversity we see around us. Children learn that despite outer differences, people around the world are very much the same. Faith, a loving family unit, and a sense of community are common threads throughout the world’s cultures. Our use of non-sectarian prayer allows each child to come to school complete with his or her own religious and cultural background. Our kindergarten classrooms enjoy the benefits of having a computer for hands-on study. Bright graphics and quick verbal (or sound) responses holds a child’s interest while providing a variety of multi-media learning experiences. Special indoor and outdoor areas are dedicated to your child’s imagination. Unstructured time provides children an opportunity to express individual interests, feelings and fears through play. 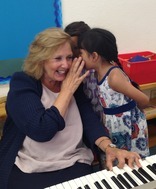 By observing such play, our teachers frequently gain new insight in how to meet the needs of a child. Children have access to a variety of imaginative play equipment such as household goods, construction tools, blocks, dress-up trunks, and puppet theaters as well as an outdoor trike track and sand areas. Play equipment, garden plots and nature areas round out the opportunities for your child to express his individuality. Our curriculum is the product of an ongoing effort to provide children with a balanced foundation of academic excellence, physical fitness, and moral strength at an early age. Our intent is to enter into a partnership of true support with the families we serve. Each member of our staff is aware of our commitment to serve your child with a vision of the adult he will someday become. Encinitas Country Day School Preschool students receive weekly music and gymnastics classes at no additional charge to their parents. Music classes are provided by Music & Motion. Mrs. Crawford works on ear training and a variety of traditional music skills using Orff instruments, singing in solfege, and movement activities to develop an understanding of rhythm, pitch, melody and harmony in her young students. Gymnastics classes are provided by Erich’s Mobile Gym. Erich and Lise are a husband and wife gymnastics team dedicated to providing basic gymnastics training and body awareness in their young students. Children arriving before and/or staying beyond the normal school day are automatically enrolled in our daycare program and their parents are billed a nominal fee according to the plan they select. Daycare programs include an after school snack, outdoor playtime and activities such as arts and crafts, story time, and seasonal fun to interest, entertain and provide a family feeling to those children spending a longer day with us. Full-time, part-time, A.M. and/or P.M. and drop-in plans are available to meet the needs of our families. 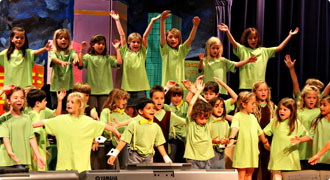 Encinitas Country Day School provides opportunities for parents to enroll their child in on-campus Piano Keyboard, Dance or Art classes for an additional charge. These classes provide parents an opportunity to support their child’s special interests without having to leave the campus. Current flyers are available in the Preschool office.